Seminal Vesicle, Epithelium - Hyperplasia. 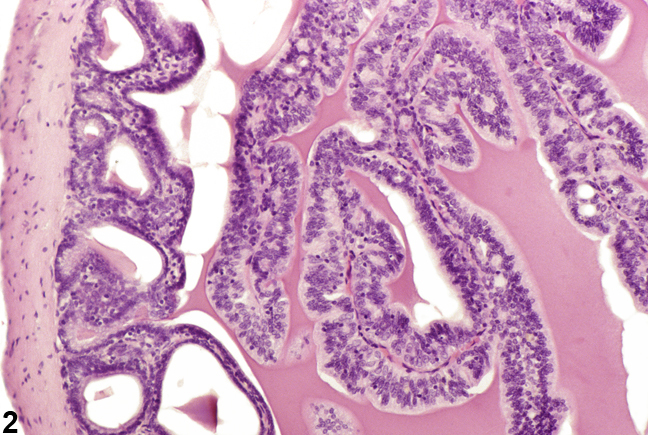 Hyperplasia of seminal vesicle epithelium in a male F344/N rat from a chronic study. Seminal Vesicle, Epithelium - Hyperplasia. 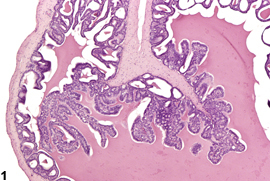 Higher magnification of Figure 1. 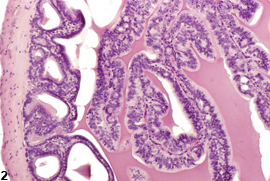 Hyperplasia of seminal vesicle epithelium in a male F344/N rat from a chronic study. 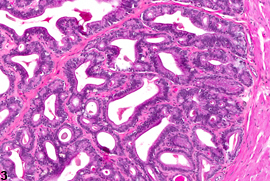 Seminal Vesicle, Epithelium - Hyperplasia. Higher magnification of Figure 3. 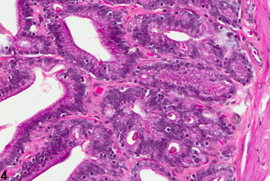 Hyperplasia of seminal vesicle epithelium in a male F344/N rat from a chronic study. 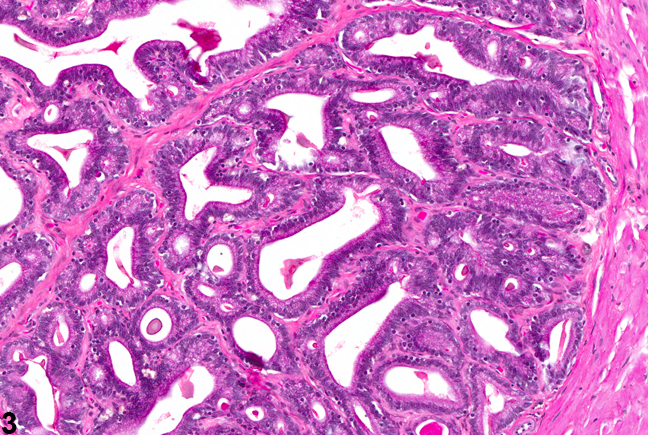 Hyperplasia of the seminal vesicle is characterized by an increase in the number of glandular epithelial cells. The proliferating epithelium may form papillary structures with supporting stroma and with extension into the glandular lumen ( Figure 1 and Figure 2 ) or a reticular pattern/cribriform pattern ( Figure 3 and Figure 4 ). In both situations, there is nuclear crowding, occasional mitotic figures, piling up, and slight basophilia of the hyperplastic epithelium. It is important to distinguish hyperplasia from glandular collapse secondary to reduced luminal secretion. Seminal vesicle hyperplasia in rats has been reported following exposure to methylnitrosourea in the presence of either ethinyl estradiol or testosterone. 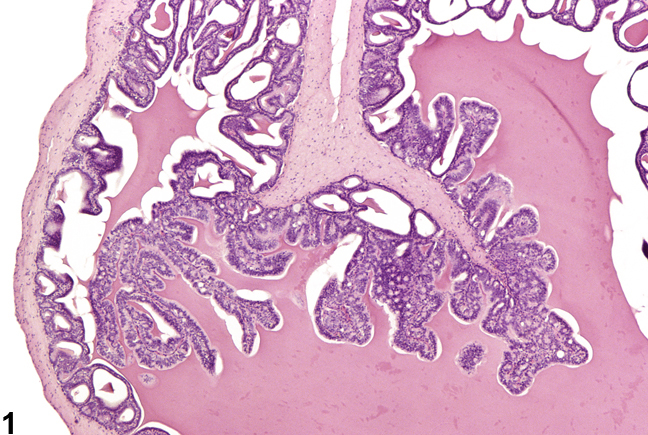 In contrast to hyperplasia, seminal vesicle adenomas form well-delineated proliferative growths with epithelial crowding, loss of normal polarity, and compression of surrounding tissue. Hyperplasia should be diagnosed and graded. If both seminal vesicles are involved, the diagnosis should be qualified as bilateral and given a severity grade based on the more severely affected seminal vesicle.